Duane Hercules, a 1982 graduate of Truman State University, and his wife Joy have made a $30,000 commitment to the “Bright Minds Bright Futures” campaign designed to benefit the accounting program in the School of Business. The Duane and Joy Hercules Family Accounting Fund will award two $2,500 scholarships each year to accounting students from St. Louis or St. Charles Counties. In addition, the fund will produce a $1,000 faculty award to an accounting faculty member based upon excellence to the profession, service to students and a positive impact on the Truman campus. The faculty award will be selected by the dean of the School of Business. A native of St. Charles County, Duane Hercules earned an accounting degree from Truman in 1982. He started his accounting career with Coopers and Lybrand, and earned a C.P.A. designation during that time. In 1984, Hercules joined Safety National Casualty Corporation and currently serves as the firm’s executive vice president of business development, chief financial officer and treasurer. He is a shareholder of the corporation and helped guide its merger with the New York Stock Exchange-traded Delphi Financial Group in 1996. Safety National is a subsidiary of Delphi, a $6 billion insurance holding company. The firm is a leading provider of innovative integrated employee benefit products and employee absence management programs designed to enhance employee productivity. The Bright Minds Bright Futures campaign continues to progress during the advance gifts phase, with $8.1 million in cash, multi-year pledges and new planned gift commitments since its launch in July 2006. The Teaching Learning Technology Roundtable’s (TLTR) Sixth Annual Technology Fair will be taking place from 1:30-5 p.m. Feb. 20 in the SUB Activities Room, the afternoon of University Conference. The Fair will showcase both exciting ways that technology can facilitate the educational process as well as other innovative ways that technology is being used at Truman. The projects that will be displayed include, among others, a look at Truman’s new online co-curricular record system for students, a tour of Truman’s Portfolio Project online submission site, the steps involved in creating “print-on-demand” books to disseminate student/faculty scholarship, plans for a Web site to consolidate listings of films showing on campus each month, Truman’s Speech and Hearing Clinic’s efforts at providing services remotely to Northeast Missouri via a telehealth network, the latest and greatest from Instructional Design Services and Truman’s instructional designer, Diane Richmond, how Pickler Memorial Library’s tech resources can benefit you, ongoing activities of Truman’s Mac User Group and Free Software Club of Kirksville, and a look at a laptop from the “One Laptop Per Child” initiative for children in developing countries. The prizes for the TruTech Challenge will be awarded in a ceremony at about 4:30 p.m.
Sungard/ITS will be sponsoring a free dessert table at the Fair until 4:30 p.m. After that time, the Tech Fair will take place in conjunction with the University Conference’s social hour. For questions about the Tech Fair, please contact Chad Mohler at chmohler@truman.edu. Truman debaters and coaches await security clearance to enter USAFA’s Fairchild Hall. Members of the Truman Forensic Union ranked third in debate sweepstakes and earned several other honors Feb. 8-10 at the 47th Annual USAFA Classic Speech and Debate Tournament at the United States Air Force Academy in Colorado Springs, Colo. Truman topped the performances of several prominent debate programs, including Rice University, Texas Tech University, Colorado College, the University of Wyoming, and the Air Force Academy to take home a coveted ceramic falcon award. Barbara Gillard, a freshman political science major from Jackson, Mo., dominated the junior division of Lincoln-Douglas debate, going undefeated throughout the tournament. Her 6-0 preliminary round record was capped by a final round defeat of a debater from the Air Force Academy. This marks the second tournament in a row in which Gillard has won the Junior Lincoln-Douglas Division. She was also ranked third speaker in her division. In parliamentary debate competition, open competitors Mark Buchheit, a sophomore history major from Carthage, Mo., and Dylan Rothermel, a senior economics major from Homewood, Ill., reached the octafinal round (“sweet 16”) of the tournament before losing to a team from Western Kentucky University that would later reach semifinals. Sarah Backhaus, a freshman political science major from Liberty, Mo., was ranked 11th speaker in the division. In the junior parliamentary division, Gillard and her “hybrid” partner from Metropolitan Community College-Longview, Calvin Anderson, reached the semifinals. Anderson was also seventh speaker in the division. He will be enrolling at Truman in the fall. Gillard and Anderson’s partnership was part of an on-going effort to encourage collaboration, and eventual transfers, from the Metropolitan Community Colleges’ only forensics program to Truman. Truman Forensics is a co-curricular program of the Department of Communication. Students interested in participating can contact Kevin Minch, director of forensics, at 785.5677 or kminch@truman.edu. 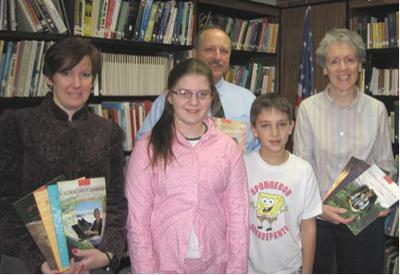 (Left to right, front row) Patricia Sexton, biochemist at KCOM and treasurer of Kirksville Sigma Xi; Kimmie Walitshek and Chance Hill, students from Louise Smith’s 5th grade science class; (left to right, back row) Neil Sargentini, microbiologist at KCOM, past president of Kirksville Sigma Xi; and Judi Misale, psychologist at Truman and president of Kirksville Sigma Xi. ; gather for the Sigma Xi book donation. Following its donation of a book series titled “Women’s Adventures in Science” to the Adair County Public Library this past summer and to the Kirksville Middle School library on Oct. 17, 2007, the Kirksville Chapter of Sigma Xi donated a third set to the Adair County R-II School in Brashear on Feb. 11. The money for the purchase of these books was donated by Sigma Xi members. There are 10 books in the series, sponsored by the National Academies of Science, each of which focuses on the life and career of a particular woman scientist. Careers described in the books include: planetary astronomy, forensic anthropology, sociology, wildlife biology, climate science, neuropsychology, biomechanics, robot design, planetary geology, and physics. The books are most appropriate for middle school students. Sigma Xi is the national Scientific Research Society, and Kirksville Sigma Xi includes faculty, staff and student members from the research communities at both Truman State University and the Kirksville College of Osteopathic Medicine at A.T. Still University. In addition to sponsoring one public lecture each spring, Kirksville Sigma Xi members participate in various community outreach projects from giving talks or tours of their research labs to local school classes to providing judges for science-related competitions. Most recently, Sigma Xi members participated in judging the regional Design and Build Competition for Middle School and High School projects. In addition, Kirksville Sigma Xi makes an annual award of Teacher of the Year for outstanding math and science teachers in area schools. More information about Kirksville Sigma Xi, recent award winners, and contact information is available online at http://sigmaxi.truman.edu. For more information about the National Sigma Xi organization go to http://www.sigmaxi.org/about/overview/index.shtml. For more information about the Women’s Adventures in Science books: http://www.nap.edu/catalog/was/. The smooth transition to a successful life after college requires more than academic skills. Topics that might arise during this life changing time range from business etiquette, repaying student loans and negotiating benefits packages to identity theft, car insurance and work-life balance. No matter what a student’s future career is, he/she will be faced with many unforeseen challenges. The Professional Development Institute (PDI), a highly selective program developed and coordinated by Polly Matteson, Career Center career coordinator, is a collaborative effort to help students prepare for their after college experience. Employers nationwide have commented that these life skills are where all college students are most unprepared. The PDI consists of workshops, guest speakers, and innovative activities on highly varied topics. Students who demonstrate a desire to grow professionally, have leadership potential and a motivation to participate in the program are strong candidates for selection. Successful completion of the two-year program will be notated on the co-curricular transcript. Matteson said she feels strongly that employers will recognize and appreciate the value of this program when recruiting Truman students. All sophomores have an opportunity to apply for admission to PDI with the application deadline set for March 15. Check the Professional Development Institute Web site at http://pdi.truman.edu for a more in-depth description of the program and the application process. If you have further questions, contact Matteson at pollym@truman.edu. universityconference/2008/ to view the complete schedule of events. The Career Expo is drawing near and below are a few things that students need to know. The Career Center will host the Service Corps of Retired Executives (SCORE) mock interviews. There are still several open slots and students may sign-up now in person in the Career Center. In order to interview, students must dress professionally and turn their résumé in 24 hours before the interview. The Career Center will be hosting Expo 411 from 11 a.m.-5 p.m. in the Violette Hall Commons. Students will be able to have their résumé critiqued, find out about how to make the most of their Expo experience, and enjoy popcorn, soda and music. 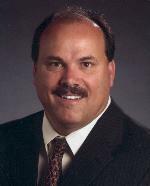 Speaker Joe Mayne will present a program titled “Establishing Your Personal Brand” at 7 p.m. in the SUB Georgian Room. This event is sponsored by Delta Sigma Pi, Alpha Kappa Psi, Beta Alpha Psi, Phi Beta Lambda, SIFE, National Association of Black Accountants and The American Marketing Association. The Career Center and Delta Sigma Pi are co-sponsoring two Map Out Your Future events. First, Lauren Monks of Edward Jones presents “Backpack to Briefcase” in the SUB Activities Room. Second, Ted Theobald of Eli Lilly presents “How to Approach a Recruiter/Networking” at 6 p.m. in the SUB Activities Room. The Career Expo takes place from 1-5 p.m. in the Student Union Building. Students can pre-register for Expo at http://career.truman.edu/CareerExpo/. The interview day for those who have pre-applied will be Feb. 28. Many companies will still sign up students to interview Feb. 28 after meeting them at Career Expo. Students are welcome to stop by the Career Center or call 785.4353 if they have any questions. Students can have their résumé and cover letter critiqued on a drop-in basis by any of the career assistants at the Career Center during the Career Center’s open business hours without an appointment. The Campus Life, Spirit and Fun Working Group will be seeking input from the campus community regarding ways to create a more vibrant campus experience for students during the University Conference. If interested in sharing ideas, please attend one of the concurrent sessions that will focus on gathering ideas. The first session will take place from 11 a.m.-noon Feb. 20 in Ophelia Parrish 2115. The second session will take place from 2:30-3:30 p.m. Feb. 20 in Magruder Hall 1090. Contact Lou Ann Gilchrist at lcg@truman.edu or 785.4111 with questions. Students who are unable to attend one of the sessions may submit their ideas on the blog at http://saffairs.truman.edu/clsf/. Matthew Beaky, associate professor of physics, will provide an overview of ongoing research projects at the Truman Observatory, including the motivation for the research, observational techniques, and examples of data acquired by Truman students. A reception will immediately follow the presentation. For more information, contact Philip Ryan at pryan@truman.edu or visit http://forum.truman.edu. The Department of Public Safety will be providing a shuttle service for students at 9 a.m. March 8 from the Department of Public Safety Building to the Amtrak station in LaPlata. The cost of the shuttle service is $5, and payment is due by March 6. The fee can be paid at the Public Safety Building. The shuttle will pick students up in LaPlata at the train station for return to the Public Safety Building at 7 p.m. March 16. Contact Joyce at 785.4177 for more information or to make reservations. Please note Public Safety provides a shuttle to LaPlata for the train going to Chicago only. More than $550,000 in scholarships will be awarded from the Truman State University Foundation this year. These scholarships are made possible through generous contributions from alumni, parents and friends of the University. Applications for the majority of the 2008-2009 Foundation scholarships available for upperclassmen are due by midnight, Feb. 28 and are available at http://www.truman.edu by clicking on Student Life / Money / Foundation Scholarships or clicking here. For more information or questions, contact the Office of Advancement at 785.4133. It is time to order official Class of 2008 custom printed graduation announcements. Visit the Truman Bookstore to purchase announcements and other graduation items, or order online at http://truman.bkstore.com. Students in the Program Implementation and Evaluation health class will be giving the first of eight different health and fitness presentations to faculty and staff members. The first of these eight sessions will take place from 10:30-11:30 a.m. Feb. 21 in Pickler Memorial Library 103 and will cover cholesterol, PSA and screenings. For more information, contact Rebecca Verhaeghe at rnv051@truman.edu. Additional presentations will be included in future issues of the Truman Today. The Assistive Technology Laboratory, located on the second floor of Pickler Memorial Library, has several adaptive devices which can help visually impaired users gain access to print and electronic library materials. Anyone who would like to use the Assistive Technology Laboratory should contact Carol Lockhart at 785.7417 or the Library’s Reference Desk at 785.4051. For more information on other Disability Services on Truman’s campus, contact Vicki Wehner at 785.4478. A Heath Awareness Fair will take place from 1-5 p.m. Feb. 21 in the Student Recreation Center Multipurpose Gym. Sponsored by the Nursing Students Association, the Fair will offer many different health screenings, body composition testing, etc. There will also be free HIV screenings from 1-6 p.m. in the SUB Activities Room. At 7 p.m. in the Baldwin Auditorium, special guest Eduardo Crespi, R.N., will give a presentation about global health and his work with the Hispanic-American community. For more information, contact Jamie Weninger at jlw820@truman.edu. This seminar will feature Myron Toews from University of Nebraska Medical Center from 12:30-1:20 p.m. Feb. 22 in Magruder Hall 2001. The presentation topic is “New Receptors and Signaling Pathways as Drug Targets for Treating Lung Disease.” Refreshments will be served at 12:15 p.m. outside of Magruder Hall 2001. The Truman Academic Competition Organization went to a sectionals tournament Feb. 9 in Tulsa, Okla., that qualifies teams for competition at a national tournament. Truman A went 13-0, winning the tournament handily and qualifying for a national tournament that will take place April 11-12 at Washington University in St. Louis. Other than having the A team qualify for nationals, Truman team members did very well individually. There were three scorers in the top five: Kent Buxton, a junior biology major from Cape Girardeau, Mo., second overall; Christopher Stone, a junior linguistics major from Springfield, Ill., fourth overall; and Ryan Stander, a sophomore history and political science double major from Liberty, Mo., fifth overall. In the next top five, Truman had two other individuals: Ali Pearson, a senior psychology major from Pacific, Mo., seventh overall; and Tyson Koenig, a sophomore history major from Perryville, Mo., 10th overall. There were more than 40 people at the event representing 11 schools, including Missouri University of Science and Technology, Kansas State University, the University of Oklahoma, Oklahoma State University and Harding University. Wolfgang Hoeschele, associate professor of geography, has an article titled “Research Agenda for a Green Economics of Abundance” published in the International Journal of Green Economics Vol. 2, No. 1, 2008 in which he outlines the ideas which are detailed in a forthcoming book. Amber Johnson, associate professor of anthropology, has a chapter titled “A Method for Anticipating Patterns in Archaeological Sequences” in “Archaeology Without Borders: Contact, Commerce, and Change in the U.S. Southwest and Northwestern Mexico,” edited by L.D. Webster & M.E. McBrinn (University Press of Colorado, 2008). “Tribe, Race, History: Native Americans in Southern New England, 1780-1880,” by Daniel Mandell, associate professor of history, has been published by Johns Hopkins University Press. The Weekly Lunch Series will not meet this week due to the University Conference Feb. 20. Truman State University is proud to present acclaimed vocal artist, Scott Piper (‘93), in a special performance of “Unchained Melodies: My Journey in Song” at 8 p.m. Feb. 21 in the Ophelia Parrish Performance Hall. Cost is $3 for students and $8 for nonstudents. Tickets are available at Edna Campbell and Ophelia Parrish 1366. Call 785.5314 with any questions. IT Services invites faculty, staff and students to TechBreak at 1:30 p.m. Feb. 22 in Violette Hall 1300. The topic of this week’s discussion is Clickers (eInstruction). Additional details and the topic schedule can be found at http://its.truman.edu/techbreak. Jacqueline Lyons will present a reading from 3:30-4 p.m. Feb. 22 in Baldwin Hall 272B. The reading will feature her poetry from the collection “The Way They Say Yes Here.” The Department of English and Linguistics is sponsoring this event. Contact Monica Barron at mbarron@truman.edu for more information. Beta Alpha Psi will be sponsoring Volunteer Income Tax Assistance (VITA) from 8 a.m.-3 p.m. Feb. 23, March 1, March 29 and April 5 in Violette Hall 1424. The members will give income tax assistance to students and the community and file their tax return electronically for free. Additional information is available at http://bap.truman.edu/eventsVITA.htm. Andrew Geyer will present a reading from 3:30-4 p.m. Feb. 25 in Baldwin Hall 100. The reading will feature his novel “Meeting the Dead” and his short fiction collection “Whispers of Dust and Bone.” The Department of English and Linguistics is sponsoring this event. Contact Monica Barron at mbarron@truman.edu for more information. Students have the opportunity to learn about the European Union or the British Victorian writers in London, United Kingdom, this summer. Economics of the European Union and British Victorian Literature will be the study abroad courses in the Missouri-London Summer Program from June 10-July 4. An informational meeting will take place at 7 p.m. Feb. 27 in McClain Hall 209. Contact Mustafa Sawani at msawani@truman.edu for more information about the economics course. Contact Linda Seidel at lseidel@truman.edu for more information about the literature course. Weekly Lunch Extra Edition Thursdays will not meet this week, but will resume Feb. 28. Jay Bulen, associate professor of music and department chair, will lead the annual Reading Circle on “Privilege, Power and Difference” by Allan Johnson. The Weekly Lunch Extra Edition Thursday sessions will meet at 12:15 p.m. in the Student Union Building Room 322. Lunch will be provided so people should go directly to the room. Students may attend a viewing of the Disney College Program E-Presentation at 7 p.m. Feb. 28 in the Student Union Building Room 320, March 5 and 25 in Student Union Building Room 319. Students will be able to learn more about this internship from Truman students who are alumni of the program. Contact Jessica Berger at tsudisneyreps@aol.com for more information. The Environmental Studies Conference 2008 is calling for papers, presentations and art. To submit a proposal, e-mail a concise abstract to blw456@truman.edu by March 31. Conference and Art Show submissions are open to students, faculty and Kirksville community members. Papers and presentations from all disciplines and backgrounds will be accepted. For more information about Earth Week events, go to http://earth.truman.edu.